The purpose of this review is to highlight the pharmacological barrier to drug development for traumatic brain injury (TBI) and to discuss best practice strategies to overcome such barriers. Specifically, this article will review the pharmacological considerations of moving from the disease target “hit” to the “lead” compound with drug-like and central nervous system (CNS) penetrant properties. In vitro assessment of drug-like properties will be detailed, followed by pre-clinical studies to ensure adequate pharmacokinetic and pharmacodynamic characteristics of response. The importance of biomarker development and utilization in both pre-clinical and clinical studies will be detailed, along with the importance of identifying diagnostic, pharmacodynamic/response, and prognostic biomarkers of injury type or severity, drug target engagement, and disease progression. This review will detail the important considerations in determining in vivo pre-clinical dose selection, as well as cross-species and human equivalent dose selection. Specific use of allometric scaling, pharmacokinetic and pharmacodynamic criteria, as well as incorporation of biomarker assessments in human dose selection for clinical trial design will also be discussed. The overarching goal of this review is to detail the pharmacological considerations in the drug development process as a method to improve both pre-clinical and clinical study design as we evaluate novel therapies to improve outcomes in patients with TBI. Current treatments for depression and PTSD only suppress symptoms, if they work at all. What if we could prevent these diseases from developing altogether? Neuroscientist and TED Fellow Rebecca Brachman shares the story of her team’s accidental discovery of a new class of drug that, for the first time ever, could prevent the negative effects of stress — and boost a person’s ability to recover and grow. Learn how these resilience-enhancing drugs could change the way we treat mental illness. [Abstract] Effectiveness of botulinum toxin treatment for upper limb spasticity after stroke over different ICF domains: a systematic review and meta-analysis. To provide a comprehensive overview of reported effects and scientific robustness of botulinum toxin (BoNT) treatment regarding the main clinical goals related to post-stroke upper limb spasticity, using the ICF classification. Embase.com, PubMed, Wiley/Cochrane Library, and Ebsco/CINAHL were searched from inception up to 16 May 2018. Randomized controlled trials comparing upper limb BoNT injections with a control intervention in stroke patients were included. A total of 1212 unique records were screened by two independent reviewers. Forty trials were identified, including 2718 stroke patients. Outcome data were pooled according to assessment timing (i.e. 4-8 and 12 weeks after injection), and categorized into six main clinical goals (i.e. spasticity-related pain, involuntary movements, passive joint motion, care ability, arm and hand use, and standing and walking performance). Sensitivity analyses were performed for the influence of study and intervention characteristics, involvement of pharmaceutical industry, and publication bias. Robust evidence is shown for the effectiveness of BoNT in reducing resistance to passive movement, as measured with the (Modified) Ashworth Score, and improving self-care ability for the affected hand and arm after intervention (p<0.005) and at follow-up (p<0.005). In addition, robust evidence is shown for the absence of effect on ‘arm-hand capacity’ at follow-up. BoNT significantly reduced ‘involuntary movements’, ‘spasticity-related pain’, and ‘carer burden’, and improved ‘passive range of motion’, while no evidence was found for ‘arm and hand use’ after intervention. In view of the robustness of current evidence, no further trials are needed to investigate BoNT for its favourable effects on resistance to passive movement of the spastic wrist and fingers, and on self-care. No trials are needed to further confirm the lack of effects of BoNT on arm-hand capacity, whereas additional trials are needed to establish the suggested favourable effects of BoNT on other ‘body functions’ which may result in clinically meaningful outcomes at ‘activity’ and ‘participation’ levels. Background: The combined use of Robot-assisted UL training and Botulinum toxin (BoNT) appear to be a promising therapeutic synergism to improve UL function in chronic stroke patients. Objective: To evaluate the effects of Robot-assisted UL training on UL spasticity, function, muscle strength and the electromyographic UL muscles activity in chronic stroke patients treated with Botulinum toxin. Methods: This single-blind, randomized, controlled trial involved 32 chronic stroke outpatients with UL spastic hemiparesis. The experimental group (n = 16) received robot-assisted UL training and BoNT treatment. The control group (n = 16) received conventional treatment combined with BoNT treatment. Training protocols lasted for 5 weeks (45 min/session, two sessions/week). Before and after rehabilitation, a blinded rater evaluated patients. The primary outcome was the Modified Ashworth Scale (MAS). Secondary outcomes were the Fugl-Meyer Assessment Scale (FMA) and the Medical Research Council Scale (MRC). The electromyographic activity of 5 UL muscles during the “hand-to-mouth” task was explored only in the experimental group and 14 healthy age-matched controls using a surface Electromyography (EMGs). Results: No significant between-group differences on the MAS and FMA were measured. The experimental group reported significantly greater improvements on UL muscle strength (p = 0.004; Cohen’s d = 0.49), shoulder abduction (p = 0.039; Cohen’s d = 0.42), external rotation (p = 0.019; Cohen’s d = 0.72), and elbow flexion (p = 0.043; Cohen’s d = 1.15) than the control group. Preliminary observation of muscular activity showed a different enhancement of the biceps brachii activation after the robot-assisted training. Conclusions: Robot-assisted training is as effective as conventional training on muscle tone reduction when combined with Botulinum toxin in chronic stroke patients with UL spasticity. However, only the robot-assisted UL training contributed to improving muscle strength. The single-group analysis and the qualitative inspection of sEMG data performed in the experimental group showed improvement in the agonist muscles activity during the hand-to-mouth task. Upper limb (UL) sensorimotor impairments are one of the major determinants of long-term disability in stroke survivors (1). Several disturbances are the manifestation of UL impairments after stroke (i.e., muscle weakness, changes in muscle tone, joint disturbances, impaired motor control). However, spasticity and weakness are the primary reason for rehabilitative intervention in the chronic stages (1–3). Historically, spasticity refers to a velocity-dependent increase in tonic stretch reflexes with exaggerated tendon jerks resulting from hyperexcitability of the stretch reflex (4) while weakness is the loss of the ability to generate the normal amount of force. From 7 to 38% of post-stroke patients complain of UL spasticity in the first year (5). The pathophysiology of spasticity is complicated, and new knowledge has progressively challenged this definition. Processes involving central and peripheral mechanisms contribute to the spastic movement disorder resulting in abnormal regulation of tonic stretch reflex and increased muscle resistance of the passively stretched muscle and deficits in agonist and antagonist coactivation (6, 7). The resulting immobilization of the muscle at a fixed length for a prolonged time induces secondary biomechanical and viscoelastic properties changes in muscles and soft tissues, and pain (8–11). These peripheral mechanisms, in turn, leads to further stiffness, and viscoelastic muscle changes (2, 8). Whether the muscular properties changes may be adaptive and secondary to paresis are uncertain. However, the management of UL spasticity should combine treatment of both the neurogenic and peripheral components of spasticity (9, 10). UL weakness after stroke is prevalent in both acute and chronic phases of recovery (3). It is a determinant of UL function in ADLs and other negative consequences such as bone mineral content (3), atrophy and altered muscle pattern of activation. Literature supports UL strengthening training effectiveness for all levels of impairment and in all stages of recovery (3). However, a small number of trials have been performed in chronic subgroup patients, and there is still controversy in including this procedure in UL rehabilitation (3). Botulinum toxin (BoNT) injection in carefully selected muscles is a valuable treatment for spastic muscles in stroke patients improving deficits in agonist and antagonist coactivation, facilitating agonist recruitment and increasing active range of motion (6–8, 12–14). However, improvements in UL activity or performance is modest (13). With a view of improving UL function after stroke, moderate to high-quality evidence support combining BoNT treatment with other rehabilitation procedures (1, 9, 15). Specifically, the integration of robotics in the UL rehabilitation holds promise for developing high-intensity, repetitive, task-specific, interactive treatment of upper limb (15). The combined use of these procedures to compensate for their limitations has been studied in only one pilot RCT reporting positive results in UL function (Fugl-Meyer UL Assessment scale) and muscular activation pattern (16). With the limits of the small sample, the results support the value of combining high-intensity UL training by robotics and BoNT treatment in patients with UL spastic paresis. Clinical scales are currently used to assess the rehabilitation treatment effects, but these outcome measures may suffer from some drawbacks that can be overcome by instrumental assessment as subjectivity, limited sensitivity, and the lack of information on the underlying training effects on motor control (17). Instrumental assessment, such as surface electromyography (sEMG) during a functional task execution allows assessing abnormal activation of spastic muscles and deficits of voluntary movements in patients with stroke. Moreover, the hand-to-mouth task is representative of Activities of Daily Life (ADL) such as eating and drinking. Kinematic analysis of the hand-to-mouth task has been widely used to assess UL functions in individuals affected by neurological diseases showing adequate to more than adequate test-retest reliability in healthy subjects (18, 19). The task involves flexing the elbow a slightly flexing the shoulder against gravity, and it is considered to be a paradigmatic functional task for the assessment of spasticity and strength deficits on the elbow muscles (17, 20). Although sEMG has been reported to be a useful assessment procedure to detect muscle activity improvement after rehabilitation, limited results have been reported (16, 21). The primary aim of this study was to explore the therapeutic synergisms of combined robot-assisted upper limb training and BoNT treatment on upper limb spasticity. The secondary aim was to evaluate the treatment effects on UL function, muscle strength, and the electromyographic activity of UL muscles during a functional task. The combined treatment would contribute to decrease UL spasticity and improve function through a combination of training effects between BoNT neurolysis and the robotic treatment. A reduction of muscle tone would parallel improvement in muscle strength ought to the high-intensity, repetitive and task-specific robotic training. Since spasticity is associated with abnormal activation of shortening muscles and deficits in voluntary movement of the UL, the sEMG assessment would target these impairments (2, 8–11, 15). A single-blind RCT with two parallel group is reported. The primary endpoint was the changes in UL spasticity while the secondary endpoints were changes in UL function, muscle strength and the electromyographic activity of UL muscles during a functional task. The study was conducted according to the tenets of the Declaration of Helsinki, the guidelines for Good Clinical Practice, and the Consolidated Standards of Reporting Trials (CONSORT), approved by the local Ethics Committee “Nucleo ricerca clinica–Research and Biostatistic Support Unit” (prog n.2366), and registered at clinical trial (NCT03590314). Chronic post-stroke patients with upper-limb spasticity referred to the Neurorehabilitation Unit (AOUI Verona) and the Physical Medicine and Rehabilitation Section, “OORR” Hospital (University of Foggia) were assessed for eligibility. Inclusion criteria were: age > 18 years, diagnosis of ischemic or hemorrhagic first-ever stroke as documented by a computerized tomography scan or magnetic resonance imaging, at least 6 months since stroke, Modified Ashworth Scale (MAS) score (shoulder and elbow) ≤ 3 and ≥1+ (22), BoNT injection within the previous 12 weeks of at least one of muscles of the affected upper limb, Mini-Mental State Examination (MMSE) score ≥24 (23) and Trunk Control Test score = 100/100 (24). Exclusion criteria were: any rehabilitation intervention in the 3 months before recruitment, bilateral cerebrovascular lesion, severe neuropsychologic impairment (global aphasia, severe attention deficit or neglect), joint orthopedic disorders. All participants were informed regarding the experimental nature of the study. Informed consent was obtained from all subjects. The local ethics committee approved the study. Each patient underwent a BoNT injection in the paretic limb. The dose of BoNT injected into the target muscle was based on the severity of spasticity in each case. Different commercial formulations of BoNT were used according to the pharmaceutical portfolio contracts of our Hospitals (Onabotulinumtoxin A, Abobotulinumtoxin A, and Incobotulinumtoxin A). The dose, volume and number of injection sites were set accordingly. A Logiq ® Book XP portable ultrasound system (GE Healthcare; Chalfont St. Giles, UK) was used to inject BoNT into the target muscle. Before the start of the study authors designed the experimental (EG) and the control group (CG) protocols. Two physiotherapists, one for each group, carried out the rehabilitation procedures. Patients of both groups received ten individual sessions (45 min/session, two sessions/week, five consecutive weeks). Treatments were performed in the rehabilitative gym of the G. B. Rossi University Hospital Neurological Rehabilitation Unit, or “OORR” Hospital. The Robot-assisted UL Training group was treated using the electromechanical device Armotion (Reha Technology, Olten, Switzerland). It is an end-effector device that allows goal-directed arm movements in a bi-dimensional space with visual feedback. It offers different training modalities such as passive, active, passive-active, perturbative, and assistive modes. The robot can move, drive or oppose the patient’s movement and allows creating a personalized treatment, varying parameters such as some repetitions, execution speed, resistance degree of motion. 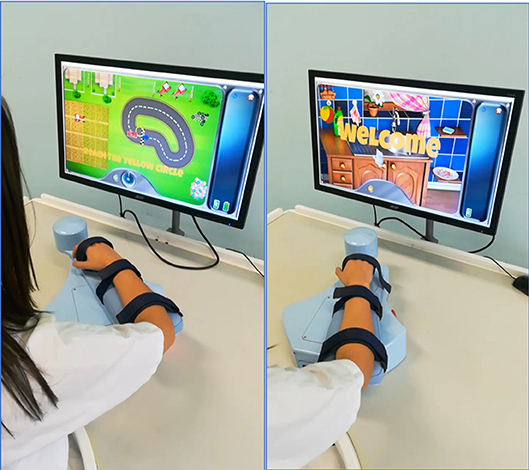 The exercises available from the software are supported by games that facilitate the functional use of the paretic arm (25). The robot is equipped with a control system called “impedance control” that modulates the robot movements for adapting to the motor behavior of the patient’s upper limb. The joints involved in the exercises were the shoulder and the elbow, is the wrist fixed to the device. The Robot-assisted UL Training consisted of passive mobilization and stretching exercises for affected UL (10 min) followed by robot-assisted exercises (35 min). Four types of exercises contained within the Armotion software and amount of repetitions were selected as follows: (i) “Collect the coins” (45–75 coins/10 min), (ii) “Drive the car” (15–25 laps/10 min), (iii) “Wash the dishes” (40–60 repetitions/10 min), and (iv) “Burst the balloons” (100–150 balloons/5 min) (Figure 1). All exercises were oriented to achieving several goals in various directions, emphasizing the elbow flexion-extension and reaching movement. The robot allows participants to execute the exercises through an “assisted as needed” control strategy. For increment the difficulty, we have varied the assisted and non-assisted modality, increasing the number of repetitions over the study period. The upper limb robot-assisted training setting. [Abstract] How effective is physical therapy for gait muscle activity in hemiparetic patients who receive botulinum toxin injections? BACKGROUND: Administration of botulinum neurotoxin A (BoNT-A) to the ankle plantar flexors in patients with hemiplegia reduces the strength of knee extension, which may decrease their walking ability. Studies have reported improvements in walking ability with physical therapy following BoNT-A administration. However, no previous studies have evaluated from an exercise physiology perspective the efficacy of physical therapy after BoNT-A administration for adult patients with hemiplegia. AIM: To investigate the effects of physical therapy following BoNT-A administration on gait electromyography for patients with hemiparesis secondary to stroke. POPULATION: Thirty-five patients with chronic stroke with spasticity were assigned to BoNT-A monotherapy (N.=18) or BoNT-A plus physical therapy (PT) (N.=17). METHODS: On the paralyzed side of the body, 300 single doses of BoNT-A were administered intramuscularly to the ankle plantar flexors. Physical therapy was performed for 2 weeks, starting from the day after administration. Gait electromyography was performed and gait parameters were measured immediately before and 2 weeks after BoNT-A administration. Relative muscle activity, coactivation indices, and walking time/distance were calculated for each phase. RESULTS: For patients who received BoNT-A monotherapy, soleus activity during the loading response decreased 2 weeks after the intervention (P<0.01). For those who received BoNT-A+PT, biceps femoris activity and knee coactivation index during the loading response and tibialis anterior activity during the pre-swing phases increased, whereas soleus and rectus femoris activities during the swing phase decreased 2 weeks after the intervention (P<0.05). These rates of change were significantly greater than those for patients who received BoNT-A monotherapy (P<0.05). CONCLUSIONS: Following BoNT-A monotherapy, soleus activity during the stance phase decreased and walking ability either remained unchanged or deteriorated. Following BoNT-A+PT, muscle activity and knee joint stability increased during the stance phase, and abnormal muscle activity during the swing phase was suppressed. CLINICAL REHABILITATION IMPACT: If botulinum treatment of the ankle plantar flexors in stroke patients is targeted to those with low knee extension strength, or if it aims to improve leg swing on the paralyzed side of the body, then physical therapy following BoNT-A administration could be an essential part of the treatment strategy. Figure 1. The upper limb robot-assisted training setting. [Abstract + References] How safe is switching antiepileptic drug manufacturers? A nationwide German study of prescription data has demonstrated that switching to an antiepileptic drug from a different manufacturer increases the risk of seizure relapse. This finding sparks a debate about the reason for seizure worsening after switching and whether or not it is a pharmacological issue. Lang, J. D. et al. Switching the manufacturer of anti-epileptic drugs is associated with higher risk of seizures. Ann. Neurol.https://doi.org/10.1002/ana.25353 (2018). Davit, B. M. et al. Comparing generic and innovator drugs: a review of 12 years of bioequivalence data from the United States Food and Drug Administration. Ann. Pharmacother. 43, 1583–1597 (2009). Krauss, G. L. et al. Assessing bioequivalence of generic antiepilepsy drugs. Ann. Neurol. 70, 221–228 (2011). Labiner, D. M. et al. Generic antiepileptic drugs and associated medical resource utilization in the United States. Neurology 74, 1566–1574 (2010). Andermann, F. et al. Compulsory generic switching of antiepileptic drugs: high switchback rates to branded compounds compared with other drug classes. Epilepsia 48, 464–469 (2007). Ting, T. J. et al. Generic lamotrigine versus brand-name Lamictal bioequivalence in patients with epilepsy: a field test of the FDA bioequivalence standard. Epilepsia 56, 1415–1424 (2015). Privitera, M. D. et al. Generic-to-generic lamotrigine switches in people with epilepsy: the randomised controlled EQUIGEN trial. Lancet Neurol. 15, 365–372 (2016). Gollwitzer, S. et al. Nonadherence to antiepileptic drugs in Germany: a retrospective, population-based study. Neurology 87, 466–472 (2016). Kesselheim, A. S. et al. Variations in pill appearance of antiepileptic drugs and the risk of nonadherence. JAMA Intern. Med. 173, 202–208 (2013). Holtkamp, M. & Theodore, W. H. Generic antiepileptic drugs — safe or harmful in patients with epilepsy? Epilepsia 59, 1273–1281 (2018). Rosi and her team first used mechanical pistons to hit anesthetized mice in precise parts of their surgically exposed brains, resulting in contusive injuries, focused blows that can also result from car accidents or being hit with a heavy object. After 4 weeks of rest, Rosi trained the mice to swim through a water maze, where they used cues to remember the location of a hidden resting platform. Healthy mice got better with practice, but the injured ones didn’t improve. However, when the injured mice were given ISRIB 3 days in a row, they were able to solve the maze just as quickly as healthy mice up to a week later, the researchers report today in the Proceedings of the National Academy of Sciences . You are currently browsing the archives for the Pharmacological category.